This project was funded in FY2017 through National Fish Habitat Action Plan funding. The North Carolina Aquarium at Pine Knoll Shores is an ideal place to learn about coastal habitats and the plants and animals that live there. However, it is also one of the many places along the coast of North Carolina experiencing shoreline erosion from sea level rise, storms, and high wave activity. 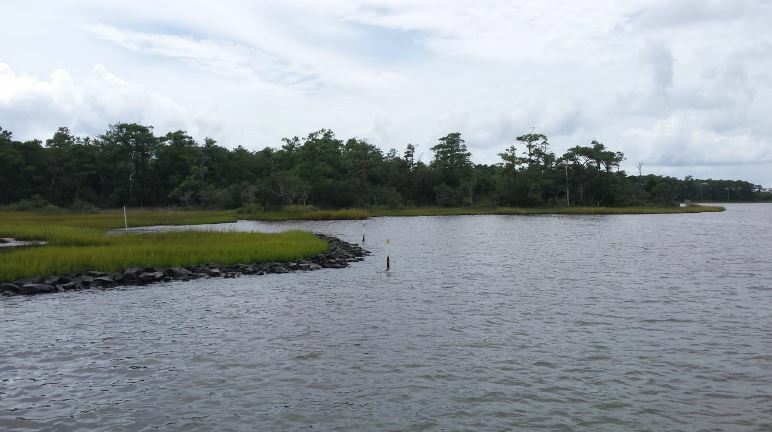 To improve shoreline stability, the North Carolina Coastal Federation and partners restored 300 linear feet of oyster reef and estuarine shoreline. This project provides valuable nursery and feeding habitat for red drum, summer flounder, three species of shrimp, and a minimum of 22 other fish species. Text and photos provided by North Carolina Coastal Federation.